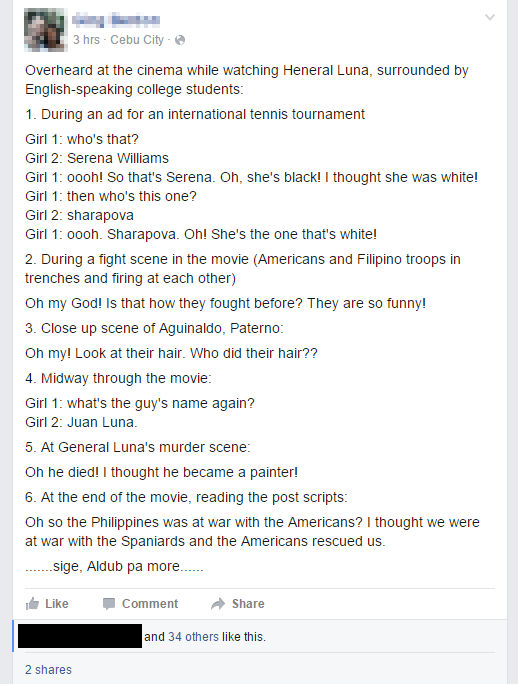 A sporty veterinarian heard a conversation between two college students while watching the movie "Heneral Luna." Please read and comment. Girl 1: oooh! So that's Serena. Oh, she's black! I thought she was white! Girl 1: then who's this one? Girl 1: oooh. Sharapova. Oh! She's the one that's white! Oh my God! Is that how they fought before? They are so funny! Oh my! Look at their hair. Who did their hair?? Girl 1: what's the guy's name again? Oh he died! I thought he became a painter! Oh so the Philippines was at war with the Americans? I thought we were at war with the Spaniards and the Americans rescued us. The post was shared twice as of this writing, but it is expected to trend and go viral in the coming days.